Live Oak Bancshares’ new joint venture company, Apiture, a a recent addition to the downtown Wilmington business community, invited members of that community to visit its new space on Wednesday. Apiture president Chris Cox said the firm currently has more than 50 employees in its 12,697 square feet of office space atop the Bank of America building on North Third Street. By the end of 2018, he predicts, the local workforce will have grown to 75, and by the end of 2019, to 125. That’s just one indicator of how rapidly the financial technology firm is spreading its wings in Wilmington. 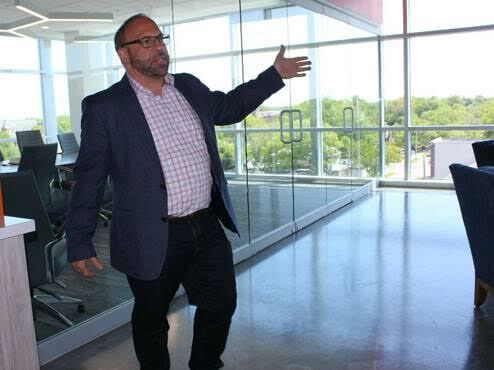 Apiture, a joint venture between Wilmington’s Live Oak and Atlanta-based First Data, officially formed in October 2017 and opened its new Wilmington offices in February. The First Data half of that partnership brought some key leadership and a significant customer base to the new entity. Apiture’s technology will enhance the array of products and services Live Oak offers to its customers. “We are new to Wilmington, but we are not a new business,” Cox said, noting that 500 banking clients use Apiture’s software. Bob Burgarino, executive vice president for product, marketing and professional services, put it another way. The firm creates financial technology products that allow financial institutions to offer increasingly sophisticated technology-based services to their customers. The firm occupies the entire fifth floor of the Bank of America building. Aperture built out the space, which was formerly unfinished, with LSP3 as the architect and Clancy & Theys as the general contractor, according to Live Oak officials. Apiture also has offices in Atlanta and in Austin, Texas, where one of its predecessors, FundsXpress, was headquartered. In 2007, First Data acquired FundsXpress, a provider of online banking and bill payment services for consumers and small businesses.